This Sunday strip started out as a daily, but a sudden late-developing seismic shift turned it into Sunday, BOOM, just like that. I think it turned out OK, what with the looming Alice, but I wish I'd had time to rejigger the panels some more so the third panel was the only large one. I don't do enough panel jiggering, or fool around enough with panel shape and size and order, mostly because I'm easily confused by things like that and I don't want to drag my readers down with me. Also because the jokes in CdS, such as they are, are scattered around the strip so haphazardly that if a reader gets lost amongst the panels he or she might circle for days looking for a punchline. And here's a bonus mystery panel from the coming Tuesday's strip, just to make things more interesting. 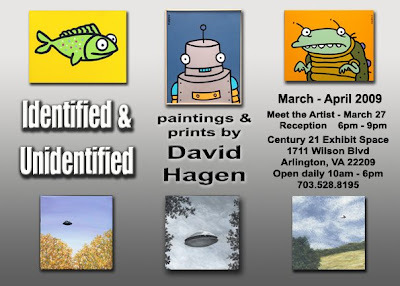 My friend David Hagen, the only man I know who's met Hillary Clinton and Mr. T, has a show of his paintings up at the Century 21 Exhibit Space at 1711 Wilson Blvd in Arlington. And tomorrow there's a reception from 6 to 9! Will Hillary and Mr. T attend? Who cares? David'll be there and that's enough for me! About five years ago I was in the parking lot of a big box store, probably Costco, and I saw the most sophisticated form of cartherding on the planet: guy driving a little electric tractor pushes a line of seeming hundreds of grocery carts gracefully across the lot. As he went by, warning lights flashing and horn beeping, everybody in the lot turned to watch, like he was an unexpected parade float. The fact that I remember this is further proof that the dial on my excitement meter only goes up to about five. Not that Dill's goes any higher. Labels: cartherders have all the fun. When I should be drawing. I'm poring over Stay Tooned, despite it's distasteful and off-putting cover (John! I'm kidding! aha-ha-ha!). It's been said that Stay Tooned is edited and published by John Read with the combined energy, charm and talent of ten men, plus two. And it's true! 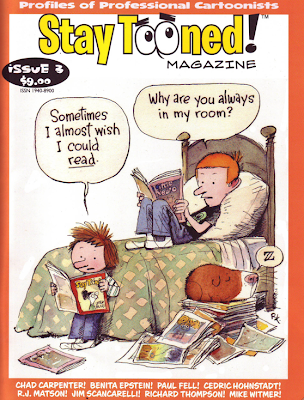 In this issue, I especially enjoyed meeting up again with RJ Matson, who I knew when he was living in DC in the 80s, reading Tom Richmond's excellent advice on drawing, and Benita Epstein's chicken cartoon, which makes me laugh every time I think of it. And I enjoyed everything else, once I got past that cover (and skipped pages 70 to 78; sheer boilerplate*). I've reread the Stephan Pastis interview by Tom Heintjes six times at least. It's funny, passionate, misanthropic, inspiring and even thrilling. Makes me want to quit my job and be a syndicated cartoonist. And there are at least 800 articles I haven't even gotten to yet. I shouldn't waste so much time drawing so I can catch up on my reading. I'm still only on page 85 of Great Expectations, and I bought the book a year ago next week. With the kind assistance of John Heltman, Dill now has his own Facebook page. Which is more than I ever expected for him (Dill, not John). 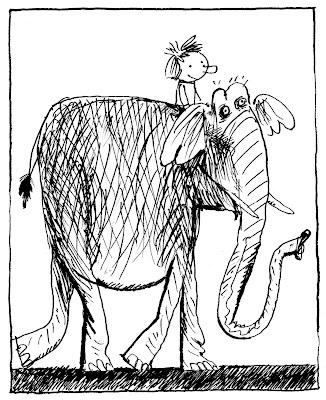 And Cul de Sac is on Facebook too! Who knew? 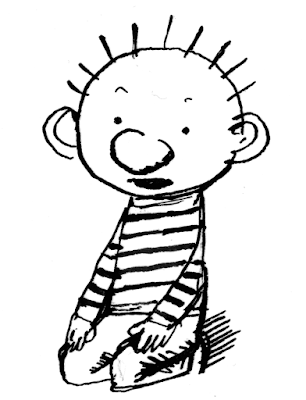 Also I'd forgotten this; Dill's last name is Wedekind, which seems like a really cheap joke. But I can't speak for his parents' sense of humor. Here's one from '04, which as you can see is pretty similar to the one below. Another lazy repost. I'll put up a slightly newer one later. But I'd guess "growth spurt". I posted this last year too. Lazy, lazy. 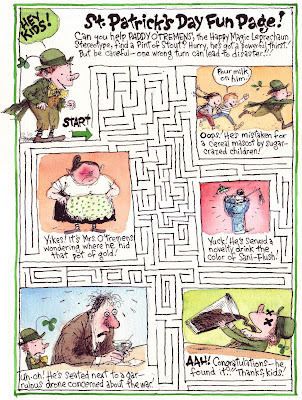 But wouldn't this make a fine novelty placemat for your Irish pub? 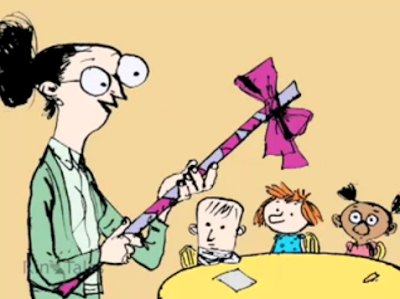 And here, I'll make this educational, if only tangentially. "Otterloop" sounds like it's Dutch, probably, but "Urquhart" I know is Scottish. And it's as much fun to type as it is to say ("Urkut"). It's a mild reference to my favorite movie, Local Hero, and its multitasking hotelier Gordon Urquhart, and also to my own Scottish heritage. Thompson is a sept of the Clan MacTavish, but I've also got Malcolm (and Whitt and Church and Scattergood and other English names) in my familly. 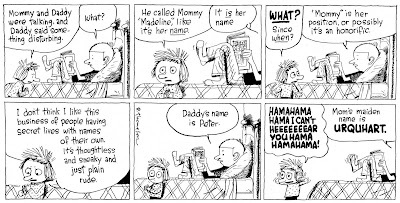 It tickles me to suppose that there was some likelihood of a hyphenated name in the Otterloop household, until they said it out loud and thought better of it. 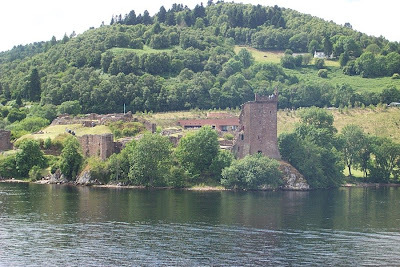 But Madeline Urquhart Otterloop could console herself with the knowledge that one of the coolest castles in Scotland is Urquhart Castle. below, and that it sits on the banks of Loch Ness. Here's an exclusive first look at a future week of Cul de Sacs in early rough form. Uh-oh, spoiler alert! You can see I'm firing on all eight cylinders with this sequence, and the three Sunday roughs on the right are obviously instant classics. Even the last one, which I can't decipher (I think it says "Farley undied"). Actually, no, I dropped the fourth and fifth strips, labeled "closet", because they're pretty obviously not funny, and substituted two called "cart". So I'm only firing on about six cylinders. But this is what my initial rough for a week looks like, when I tally up the loose ideas stirring around in my head to see if there are enough to fill a week, or even two. There's a kind of raw power and beauty to this stage of the process, I think, and it's lost when the extraneous elements are added. You know, the lettering, the drawing, the squared boxes, the point, all the things that editors deem as necessary for a comic strip and that clutter up my time. In the future this will all be so much easier, when they develop that Wacom tablet that you'll wear like a hat, with its instant imaging cranial interface that'll further undermine the existence of print, or paper, or pen & ink, or any kind of instrumentality at all. Then we'll be like the Krell in Forbidden Planet. If "Monsters from the Id" wasn't too close to the title of an existing comic strip I'd go ahead and copyright it right now. Back when the Almanac was printed wider, and sometimes even in color, I did a few cut-out bobbleheads of newsworthy individuals. And who's more newsworthy than weirdly foreshortened megalomaniac Kim Jong Il? 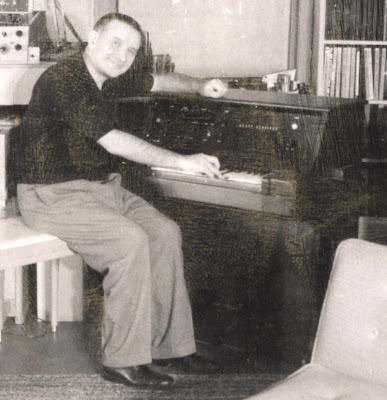 Actually I'm just posting this as a consolation toy for all of you who didn't want to cough up $48 for a tiny rubber Raymond Scott. I swiped a bit of dialog for today's Cul de Sac (above) from an illustration I dId for Why Things Are at least 14 years ago (below). The small girl in the illustration, who's something of a proto-Alice, is my then-expected older daughter Emma, who turned out to look only slightly like that. What I like best is the drawing Emma's done. I wish I could draw like that all the time. It's probably dangerous to think you're drawing with childlike innocence and immediacy; dangerous only in that you're just kidding yourself. Adult perspective is not so lightly overthrown. But maybe if you think of it as post-expressionism it's okay, and by you of course I mean me. Wouldn't it be fun to draw the whole strip in this style? And by fun I mean for me. Probably less so for you, or for the people who complain about stylistic changes in comic strips. And, seriously, that's a little better than most four year olds draw, if I do say so myself. In honor of the centennial of the birth of musical mad scientist Raymond Scott, the toy company Presspop has produced an action figure of the poor unsuspecting man. It's terrifyingly realistic, and includes a CD, a clavivox and a pointing finger to play the clavivox with. You know Scott's music whether you know it or not. Likely it's permeated your consciousness through its use in old Warner Brother's cartoons via Carl Stalling. And there are a dozen or more CDs of Scott's music, some performed by him and his quintette, others by bands like the Beau Hunks. 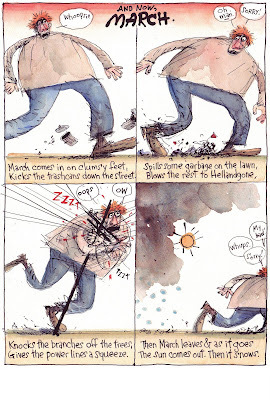 Scott himself made an appearance in Michael Chabon's Adventures of Kavalier & Clay, at a party where Salvador Dali wore a deep sea diving suit. 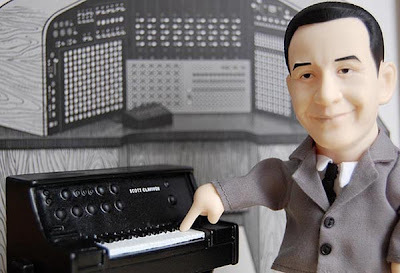 And now you can have your very own six inch tall Raymond Scott to fill that Raymond Scott-size space on your shelf. My thanks to Ted Pratt for pointing this out to me. I'm not sure this makes much sense, but it made me laugh when I thought it up (which is often a warning sign). Originally there was as set-back-your-clock joke in there somewhere too, but it got lost in the final. And I'm not sure if "Pecunia Fugit" is correct, because I don't know Latin. Update: it should be up again next week. I'll let you know. 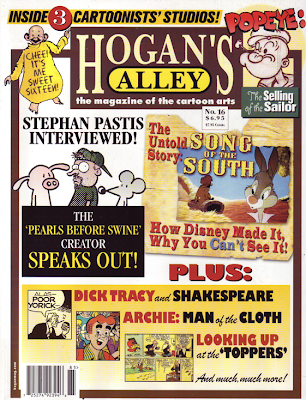 A few months back I did a joint interview with the below-mentioned genius, Stephan Pastis, for Comic-Con Magazine, courtesy of the gracious Gary Sassaman. Well, the whole magazine is online here. You can turn the pages and everything, and little lap cards fall out of your computer screen. You'll instantly notice that Stephan is better-spoken, better-groomed and generally more thoughtful than I am. I think he's taller, too. Here's a repost from last year, only because we're expecting 5 to 8 inches of snow.